Model 51000 (left handed). Hand-forged hammer made in Germany, fully heat-treated and polished, fitted with an all leather bell-style grip. Left handed models only. The nail puller is slotted on the sides of the claw. Square checkered hammer face offers sharp corners. Beveled shank for cutting slates. 23.7 ounces (672 gm), 12.75 inches long, 8.5 inch head, 3/4 inch X 3/4 inch face. 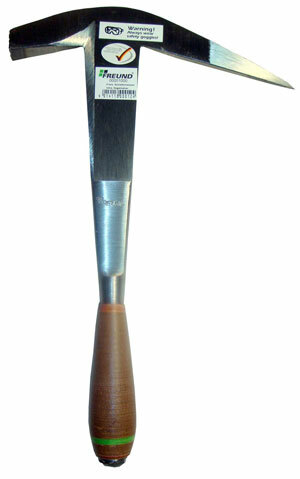 Use this hammer with a slaters stake when cutting slate.